源记). It is in the Medan Selera Jinjang just next to the Ipoh Road Yong Tao Fu in Jinjang Utara. This area is better known as 3 temples (三间庙) because there are 3 Taoist temples here. Yuen Kee is your typical 'dai chou' which also serves steam boat. 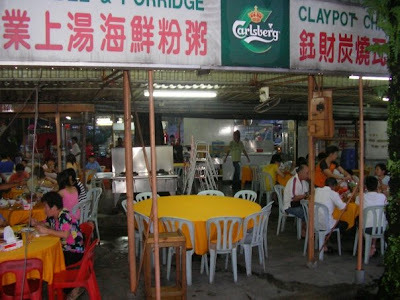 Most of the customers come here for the steamboat and order their a la carte as side dishes. We didn't order steamboat. We ordered a few dishes and eat with rice. You can easily regconize Yuen Kee from the yellow table cloth. We reached about 7.30 p.m. and at 8.00 p.m. the place was already packed with customers. So, come earlier if you don't want to wait long for a table. 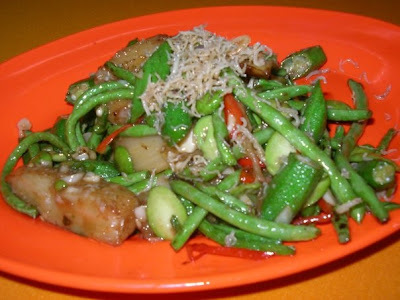 Stir fried using 4 different kind of vegetables namely lady fingers, brinjal, petai, and long beans. What I like about this is that the cook got the right timing for this dish. The vegetables are not overcook. When I bite into the long bean or petai, I can still feel the crunchiness and fresh taste of 'green'. It is also not very salty. After Four Heavenly Kings, we have Four Treasures. 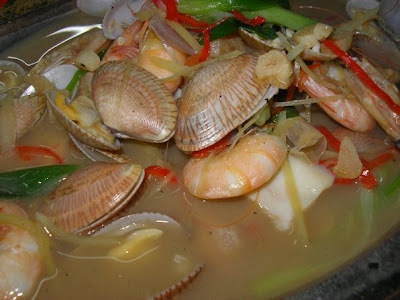 This dish consist of lala (clam), prawn, sliced abalone, and dried scallop cooked in fish stock seasoned with ginger and Chinese wine. 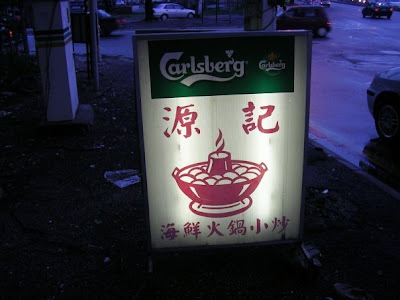 Enough said, by looking at the ingredient put in to the soup, you'll know that the soup taste very good. Filled with the taste of seafood this dish is a must try. 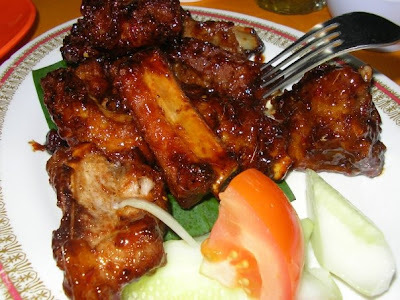 Stir fried marinated pork ribs. Taste like honey or 'mug nga'. Meat is tender and not hard to bite off. The fat and lean meat is quite balanced. I didn't find a piece that only with fat or only with lean meat. Might be a bit to sweet for my taste though. 奶油 mantis prawn, very different from the one that I eat at other 'dai chou'. 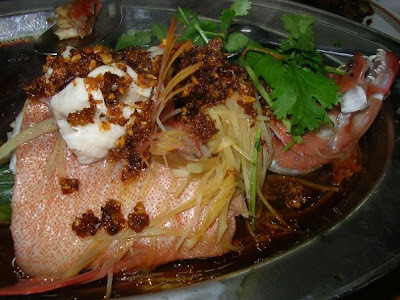 Usually the other will fried the mantis prawn until very dry and sprinkle friend shredded coconut meat. 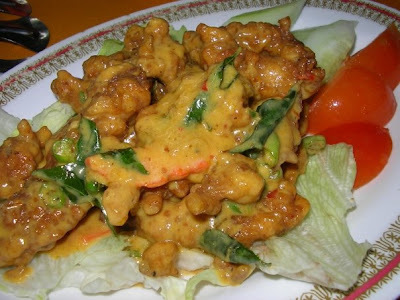 The way they do this dish here is stir fried the mantis prawn and then cover it with 奶油 sauce (butter cream). The butterish taste is just great. The fastest dish to finish that night. Golden actually meant crab stir fried with salted egg yolk. Quite a popular way to cook up some crabs nowadays. It's been a long time I haven't eaten crabs. My favourite part is the crab shell which you can find some crab roe. Lucky enough, there's some in these crabs that we ordered. Even though cooked with salty egg yolk, it's not too salty. I licked the whole crab, only then I eat the meat. Nice craps crab. Sorry, I don't know what's this fish called in English. Steamed with soya sauce and some ginger. It is right choice because for this fish too much sauce will spoiled the taste. The meat is so fresh and sweet. The sweetness that you get from seafood not sugar. It is not whole fish though, we only ordered a quarter. This dish is absolutely wonderful. My aunt told us that the fried rice here is very good, so this is an additional order. 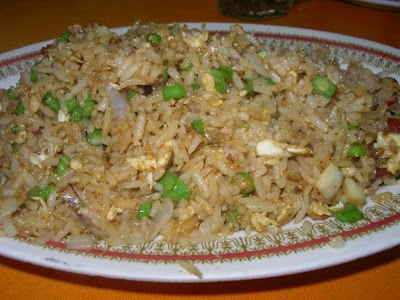 To me the fried rice is ok, not too bad. I just don't know why my aunt thinks it's very good. Maybe I'm not a fried rice person. The total bill including the 5 bowl of white rice, 1 small bowl of white rice and a pot of tea for 5 is RM 133.80. Near 3 temples, Jalan Kepong. ishh... looks quite nice eh..
the pork ribs looked yummy!!! looks good ar..the 4 treasures..nvr see b4..abit like sheong tong lala i presume? oh mans. the food looks so good. i am CRAVING for seafood now. Simon, wherabout exactly is this Restaurant? Looks good. I stayed around Manjalara, appreciate if you could provide the direction. eee, from the Manjalara school, straight on? near to Jusco? Looks good and sounds good! so delicious looking! food-cookies: thanks, yours not bad too. Yeah, when go call and order lobster for RM 150.
monica: yeah, quite juicy, slurp, slurp. joe: yeap, something like siong tong lala but with more ingredients. vic: come la, one day we go eat with Pusu. anonymous: you live in Manjalara yet you don't know where is Jinjang Utara? Just take go to the road where Carrefour is on your left, all the way straight until you see eating stalls with zinc roof. Look out for yellow table cloth and Chinese temples on your left. The Yuen Kee name board is by the road side. BBO: yeap, heard they serve a lobster set too, call them to book for RM 150 a lobster set. Oh, now I know. A bit blur cos I just moved to Manjalara 2 months ago. Still very new to this place. Anyway, thanks for the direction. 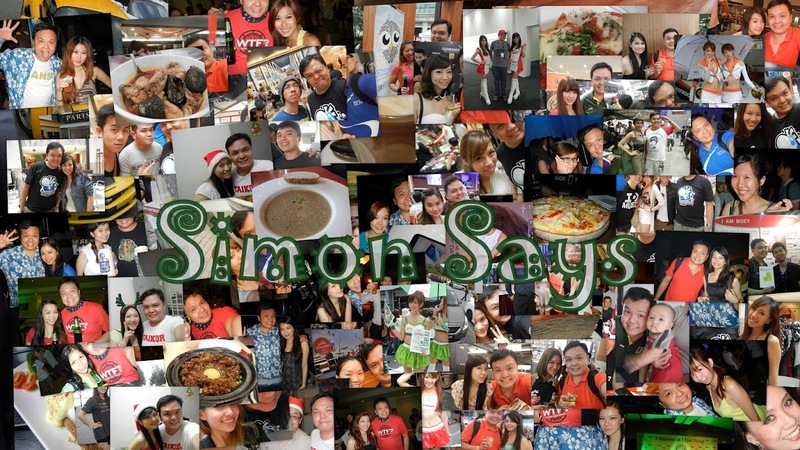 Looking forward to more of your food blogs in Kepong. Cheers! Oh, no wonder lah. Thanks for dropping by. Yah, there's a few restaurants opposite Metro Prima that I'm going to try out. 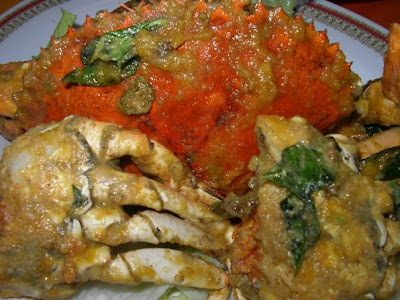 urghh...golden crab!! i like it..
Oh I so wanna try that Four Treasures!! wah the four treasure looks great! ky: yeap, the soup really got kicks. the other dishes not bad too. RM 40/kg for the crab??? No way! The rest ok.